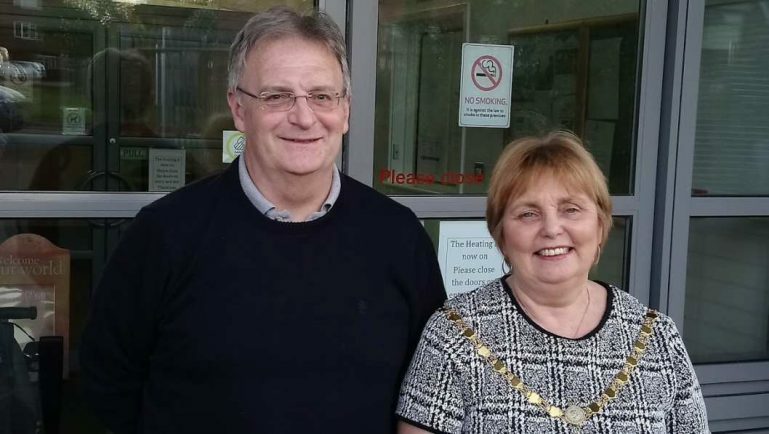 Parish Council chair Sue Redman with her vice chair Councillor Colin Summers. THE Redditch Eastern Gateway and increased housing along the A435 in Studley’s new town neighbour have been named as two of the challenges facing the village by incoming parish council chair Councillor Sue Redman. Coun Redman was elected to lead the council on Tuesday night and takes over from Coun Paul Beaman. Coun Colin Summers was elected vice chair. And while Coun Redman said she was keen to concentrate on promoting the many local groups and volunteers within the village, she was wary of continuing developments in Redditch. “The challenges we face include the Redditch triangle development – the Eastern Gateway – and housing at the back of the estates running down the A435,” she said. She also said there would be housing pressures in Studley too. She added that raising money to improve Studley Scout Hut would be her chosen charity for the year. The Scout Hut plays a key role in the village for youngsters aged six to 14 catering for Cubs, Scouts, and Beavers and is so popular more adult volunteers are needed to help out. “I have always focused on local groups and volunteering in Studley,” said Coun Redman, who has held the chair twice previously. “And for me the charity I want to focus on is the Scout Hut which is such a well used building.